This Arris SURFboard SB6141 review came about in an interesting way. Sometimes when a thing breaks and you need something just to replace it you just buy the first cheapest thing you can get your hands on just to replace it for a while until you actually have time to get something better. Some time ago, I was in the market for a new cable modem. My previous modem had stopped working unexpectedly, leaving me without a way of accessing the internet. I work from home, so I knew I had to find a modem that was compatible with my service provider as soon as possible. I was losing money from not working, and my clients were getting angry. If I didn’t come up with a solution quickly, I could've missed a lot of deadlines. I wish I knew about the Arris SURFboard SB6141 before losing access to the internet, even though I settled on a later model. There are a few things to keep in mind when buying a cable modem. First of all, you should ensure that your router is compatible with your service provider, as some brands will only work for certain ISPs. You should also look for a high-performance model that allows you to harness the full speed of your data plan, as well as being reliable and simple to use. It’s important to choose a modem that does not create a bottleneck in terms of network performance. Bottlenecks happen when the modem causes your speeds to drop, which can be misconstrued as a problem with your computer or service provider. The good news is that these bottlenecks are rare, although they can still happen if you purchase modems from unknown brands. The second most important consideration to make when purchasing a modem is the device’s maximum speed. Although the speeds of 300mb/s may not be achievable in reality, having a higher theoretical speed means that you can be assured you are getting the most out of your modem, and that eliminates the need to second guess your hardware. One product that seems to tick all the boxes in terms of ISP compatibility, speed, and popular reviews is the Arris Motorola SB6141. What is the Arris Motorola SB6141? 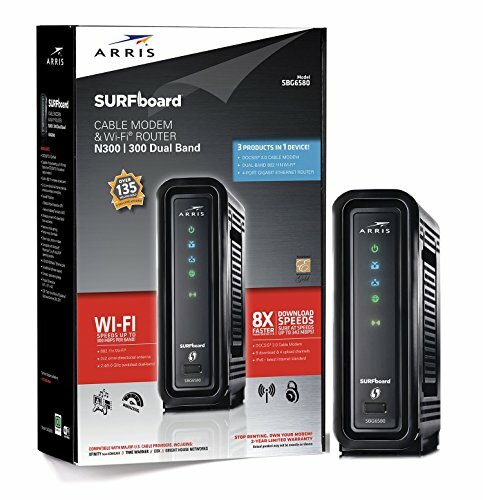 As our Arris SURFboard SB6141 Review says the this model is compatible with nine out of the ten cable internet companies in the US, which gives modem a significant advantage over other models that only work with a handful of providers. The ease of compatibility makes Motorola’s SB6141 an easy model to upgrade to. It’s also likely that you’ll be able to hang on to the modem even if you change internet providers. The device also comes with a two-year manufacturer’s warranty, which can save you on expensive maintenance costs, as well as giving you some peace of mind about your purchase. In short, the Arris Motorola is for anyone who wants a top of the line modem that may save them time and money over the long-term. This model is significantly more expensive than other options in the market, so if you are looking for a budget model then this is not for you. DOCSIS is an acronym that means Data Over Cable Interface Specification. This specification designates the protocol that your cable provider uses to communicate to your modem, as well as providing you with internet access. The current iteration of DOCSIS is DOCSIS 3.0, which is the industry standard. You won’t be able to use wireless networking without a router, so it could be seen as a good idea that Motorola included a Gigabit Ethernet port to allow you to do this. One slight annoyance of the this model is that there’s no power or reset switch on the device. If you want to turn off your modem without going through your modem’s firmware, then you will need to manually unplug the device every time you want to reset it. The lack of a hard reset button is arguably not a big deal, but it’s still something to keep in mind. Thanks to the well-ventilated housing of the SB6141, the unit’s average temperature is about 87.5 degrees Fahrenheit, which is quite low for modems of its type. The low temperature means that the modem draws less electricity, which saves you money, as well as increasing its lifespan. The performance of the this model could be seen as a desirable selling point of the modem, which is due to its 8×4 channel bonding. The bonding of the modem means that there are eight downstream channels, as well as four upstream channels, resulting in a fastest possible download speed of 343 Mbps and an upload rate of 131 Mbps. Although it’s not technically possible to get speeds this fast, the upload and download rates eliminate the possibility of bottlenecks forming as a result of your modem choice, which could give you some peace of mind. The modem is constructed from industrial strength plastic that was apparently designed to go the distance. It’s likely that you may drop your modem unexpectedly, or it may be exposed to adverse conditions that can leave scratches and marks on the modem’s surface. The sturdy construction of the modem is important, as the plastic protects the vital circuit board and processor that is housed in its interior. Compatible with nearly all cable providers in the US. High maximum download speed. (343 Mbps). Does not work with little-known service providers. Does not feature a power or reset button. Arris provides a two-year warranty for their modem, which should give you an ample amount of time to detect any out of the box defects. Modems are not overly complex devices, so if yours works smoothly for the first few months, then you can probably rest easy for the next few years. You can always contact Arris’ technical support team via phone or email if you have to. The SB6141 supports DOCSIS 3.0, which helps bring many different data streams into one. The combining of different streams of data is also known as data binding, which is attributed to achieving download speeds that are many times faster than the previous protocols of DOCSIS. You can get up and running with the this model in roughly 36 seconds from boot to browser connectivity. The boot time isn’t a huge concern, although some models are faster such as the Netgear CM400 and the Zoom 5341J. The Arris Motorola SB6141 Gigabit Router comes packed with a small documentation flier, an installation booklet, a wall power adapter, a small ethernet cable, a warranty which is only available if you save the receipt and of course, the modem itself. The Arris Motorola SB6141 has a power consumption of 9 Watts, features IPv4 support, IPv6 support, auto-negotiation, auto-uplink (auto MDI/MDI-X), has the following line coding formats 128 QAM, 16 QAM, 256 QAM, 32 QAM, 64 QAM, 8 QAM, QPSK. It connects through an RJ-45 cable, supports all the known OSs including Mac and Linux. Choosing a cable modem is often not as straightforward as it’s made out to be, which is due to the numerous brands all competing for your attention. The Arris Motorola SB6141 cuts through this marketing noise and delivers a reliable, fast, and robust quality of service at an affordable price. The DOCSIS 3.0 standard means that it is unlikely you’ll encounter any bottlenecks in your home office, while the two-year warranty and sturdy design help to alleviate any fears you may have about reliability, and if the model is built to go the distance. In case you liked our Arris SURFboard SB6141 review and want to find out where you can get it then just click on any modem image.